1. Justice is the divine correction for injustice. Injustice is the basis for all the judgments of the world. Justice corrects the interpretations to which injustice gives rise, and cancels them out. Neither justice nor injustice exists in Heaven, for error is impossible and correction meaningless. In this world, however, forgiveness depends on justice, since all attack can only be unjust. Justice is the Holy Spirit's verdict upon the world. Except in His judgment justice is impossible, for no one in the world is capable of making only just interpretations and laying all injustices aside. If God's Son were fairly judged, there would be no need for salvation. The thought of separation would have been forever inconceivable. 2. 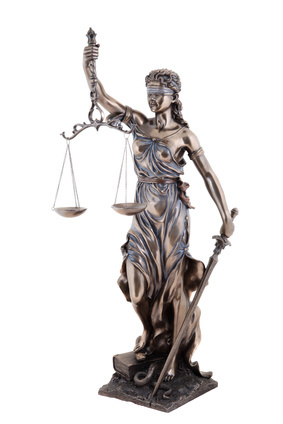 Justice, like its opposite, is an interpretation. It is, however, the one interpretation that leads to truth. This becomes possible because, while it is not true in itself, justice includes nothing that opposes truth. There is no inherent conflict between justice and truth; one is but the first small step in the direction of the other. The path becomes quite different as one goes along. Nor could all the magnificence, the grandeur of the scene and the enormous opening vistas that rise to meet one as the journey continues, be foretold from the outset. Yet even these, whose splendor reaches indescribable heights as one proceeds, fall short indeed of all that wait when the pathway ceases and time ends with it. But somewhere one must start. 3. All concepts of your brothers and yourself; all fears of future states and all concerns about the past, stem from injustice. Here is the lens which, held before the body's eyes, distorts perception and brings witness of the distorted world back to the mind that made the lens and holds it very dear. "Sins" are perceived and justified by careful selectivity in which all thought of wholeness must be lost. Forgiveness has no place in such a scheme, for not one "sin" but seems forever true. 4. Salvation is God's justice. It restores to your awareness the wholeness of the fragments you perceive as broken off and separate. And it is this that overcomes the fear of death. For separate fragments must decay and die, but wholeness is immortal. It remains forever and forever like its Creator, being one with Him. God's Judgment is His justice. Onto this,--a Judgment wholly lacking in condemnation; an evaluation based entirely on love,--you have projected your injustice, giving God the lens of warped perception through which you look. Now it belongs to Him and not to you. You are afraid of Him, and do not see you hate and fear your Self as enemy. 5. Pray for God's justice, and do not confuse His mercy with your own insanity. Perception can make whatever picture the mind desires to see. In this lies either Heaven or hell, as you elect. God's justice points to Heaven just because it is entirely impartial. It accepts all evidence that is brought before it, omitting nothing and assessing nothing as separate and apart from all the rest. From this one standpoint does it judge, and this alone. Here all attack and condemnation becomes meaningless and indefensible. Perception rests, the mind is still, and light returns again. What had been lost has now been found. The peace of God descends on all the world, and we can see.